After installing and upgrading to Microsoft Office 2013 SP1, Microsoft Outlook 2013 stuck and appeared hang and frozen at “Loading Profile” or “Processing” stage at splash screen when user is running and opening Outlook. As the result, user is unable to run and use Outlook, even though user can start and enter Outlook in safe mode, and disable all add-ins. The issue appears to be related to how Windows Aero theme is rendered on graphics accelerator card with hardware acceleration support, and the changes that were implemented by Outlook 2013 SP1 on hardware acceleration mechanism. The error happens on machines that have two graphics cards, or with outdated and buggy display adapter driver. Update the graphics video card driver – Check for updates through Windows Update, and from hardware manufacturers such as Nvidia and AMD (ATI). Disable hardware graphics acceleration – Go to File -> Options -> Advanced in any Office 2013 program (non Outlook app such as Word, Excel or PowerPoint will work too if you can’t open Outlook), and check the Disable hardware graphics acceleration option under “Display” section. Disable Windows Aero – If you’re using Aero theme, you can change to a non-Aero theme such as “Windows 7 Basic” or a “High Contrast Theme” in Control Panel -> Appearance and Personalization -> Personalization. Alternatively, go to Control Panel -> System and Security -> System, and click on Advanced system settings. In the Advanced tab, go to Settings button under Performance section. 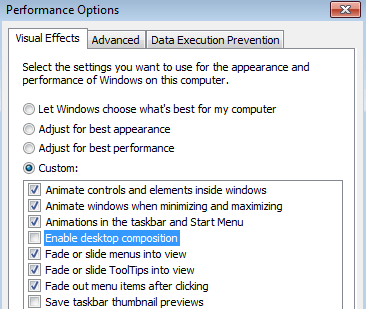 In “Performance Options”, uncheck Enable Desktop Composition. Do note that disable Windows Aero or Desktop Composition will affect all running programs.